Производство: Безар филм и Corazón Int. «Min Dît: Дети Диярбакира» (англ. : Min Dît: The Children of Diyarbakır; по-курдски: Min Dît; по-турецки: Ben Gördüm;) курдский художественный фильм-драма, написанная, спродюсированная и снятая немецким режиссером курдского происхождения Миразом Безаром, по повести алевитско-курдского журналиста и новеллиста Еврима Алатаса, о беспризорных детях в турецком городе Диярбакыр. Фильм, который попал в общенациональной турецкий прокат 2 апреля 2010 г. Этот фильм стал первым фильмом в Турции, который был снят на курдском языке и завоевали награды на кинофестивалях в Сан-Себастьяне, Анталии и Стамбуле. Режисер Мираз Безар родился в Анкаре, однако в возрасте десяти лет он уезжает в Германию. Покинув родную землю он не расстается с ней в своем сердце. У него появляется желание написать какое-то произведение о турецком Курдистане. Однако, он не пожелал создавать свой сценарий в Германии, желая чтобы фильм был максимально правдоподобным. он отправился за поиском сценария в Диарбакыр (курд. Амед) сразу после окончания Берлинской академии кинематографии и воссоздал в сценарии истории с людьми, с которыми судьба помогла ему встретиться. Он начал работать в паре со своим дядей Эвримом Алаташем, который является журналистом и сценаристом краткометражных фильмов. Miraz Bezar cast the actors himself. Şenay Orak and Muhammed Al were cast after the director met them on a bus trip to Urfa. Their highly acclaimed performances have been attributable to the fact that they are not only very talented child-actors but are also children who suffered experiences similar to the characters in the film. Hakan Karsak, who plays one of the paramilitary murderers, was cast after the director had seen him on stage and was taken by his passion and talent while other adult performers including Fahriye Çelik, Alişan Önlü, Berivan Eminoğlu and Berivan Ayaz were also recruited locally. Suzan İlir was cast after trying to sell the director a bottle of water in one of the cemeteries in Diyarbakır. She at first did not want to tell me her name, but I finally convinced her that I was going to shoot a film and that I want her to help me. In order to raise the initial budget of 80,000 euros for the film, Bezar’s mother sold her house and his uncle paid the team’s hotel expenses. Each time I felt like we were at the edge of the abyss some small thing would come and pull us back, a reminder of why it was so important to tell this story, the director has said. There are still team members who have not gotten paid. Most of them did it to support the film. Well-known German-Turkish director Fatih Akın later joined Klaus Maeck as co-producer after he was shown a rough cut of the film. It was a real challenge to do this film because we never knew if it would make it through the censorship in Turkey, the director has stated, so much of the Turkish state has been built on lies; that there is only one people, only one language. I think that an opening is still too big of a word for what is happening,” he has said, “but it’s worth remembering that all the things that were taboo when we started writing and shooting the film are now beginning to be talked about. No matter what, I finally did what I wanted to do, this can be a small step in the right direction. The lives of 10-year-old Gülistan and her brother, Fırat, are turned upside down one quiet and dark night on the Diyarbakır-Batman highway while they’re on their way home with their parents from a wedding in a nearby village. Their father, a journalist working with a local newspaper, and their mother, who gave birth just six months ago to their baby sister, Dilovan, are murdered by paramilitary forces. The kids are taken care of by their aunt, the sister of their late mother. However, a few weeks on, their aunt goes missing, too. Left alone to look after their baby sister at such a young age, when they are not even capable of taking care of themselves, the kids are left penniless, and a few weeks later, they are forced to live on the streets of Diyarbakır, where they will have to fight really hard to survive. The film received its controversial Turkish premiere at the 46th Antalya Golden Orange Film Festival, where some audience members protested that, There has never been a Kurdish state and there will never be one. To which the director responded, Cinema is a form of art. People do not have to agree with or believe in what they saw. The film was later awarded the grand jury prize. Out of political reasons no Turkish distributor wanted to distribute the film. So director Miraz Bezar had to distribute the film himself. Nevertheless the film opened in Turkey on April 2, 2010 on nine Theatres in Ankara, Van, Diyarbakır, Mersin and Urfa and found an audience of 24.000. The film twice reached number nineteen in the Turkish box office and has made a worldwide total gross of US$101,327. Andrew Finkel, writing about the film's premiere in Today's Zaman, states, there was a standing ovation for what promises to be the most controversial film of the festival, it is the first feature-length film of Miraz Bezar and one with heart and meaning. The film's young stars were themselves recruited from the bands of young marauding street vendors to whom the film is dedicated, and, he continues, Şenay Orak, who plays the sister, has a face as economical in expression as Robert Mitchum's and a more schooled performers ability to evince a world of emotion with a single blink. Like “Slumdog Millionaire,” the film is uplifting, but, he continues, Unlike “Slumdog,” the plot is not mawkishly sentimental and only a little bit contrived. Not everyone, of course, cheered, he concludes, “Min Dît” is not the sort of story that will comfort the prejudices of a Turkish audience nor is Kurdish a language they expect to hear. We must wait to see what sort of reception it gets. Emrah Güler, writing in Hürriyet Daily News, describes the film as, the latest in a line of movies focusing on the Kurdish problem in Southeast Anatolia, which he believes indicates that, the Turkish government’s Kurdish initiative seems to be working for Turkish cinema. He warns, those who might find orphaned children on the streets too heavy for weekend entertainment, but recommends the film to, those interested in catching a glimpse of uncharted territory for Turkish cinema. Emine Yıldırım, writing about the films screening at the Istanbul Film Festival in Today's Zaman, describes the film as, a worthy watch, which might be a personal story, but Turkey is no stranger to its premise; it is successful in bringing to light the plight of many children orphaned in Turkey’s southeastern Anatolia region due to political conflicts. Make no mistake, the review continues, this is a tragic tale, but it comes out as truthful as it can and should be, despite Bezar’s occasional inclination toward an idealist reductionism on political issues. 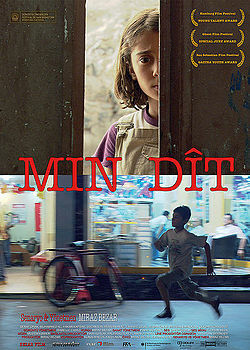 The review concludes, Perhaps not a perfect film, though such should be accepted of a debut, “Min Dît” is a raw and genuine story. While Yavuz Baydar, in the same publication, calls it, one of the highlights of the festival.